Cost $295: Payment due at time of sign up. Lecture: TBA 2019. In the pre field trip lecture, we will discuss digital shooting techniques as they apply to hiking in the forest. We will concentrate on composition and lighting; the most important aspects to great photography. We will also work on tips and techniques to photographing waterfalls, wildlife, and close-ups. Finally we will discuss equipment and the logistics of the field trip. Lecture location will be on Highland Road in Baton Rouge. 12 noon to 2:00. Lunch will be provided. Field Trip: We will meet at the intersection on Highway 61 at 7:30am and drive about 30 minutes to our shooting location in the rugged Tunica Hills. We will hike on trails to a creek with several waterfalls. The area should be dressed in beautiful spring foliage. 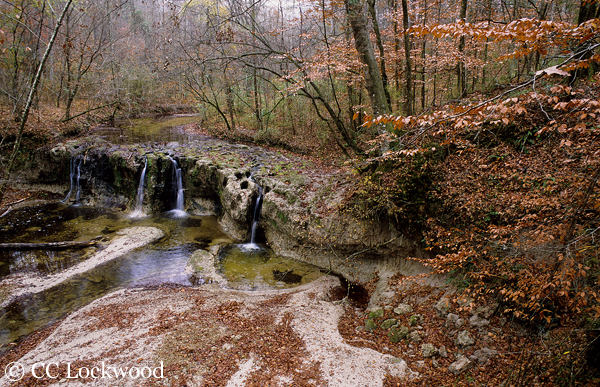 We will work on landscape compositions of flora, waterfalls, streams, and close-ups. The hike will be about 2 miles with steep trails. Call us if you need more info on the terrain. We will eat lunch on the trail. We will get back to our vehicles by or before 2:00pm. Other Gear: Small backpack, sack lunch, drink/water, small towel, hat, sunscreen, sunglasses, mosquito repellent, notebook, pen and clothes for the current weather. Boots, tennis or Tevas are good shoes. Critique Session: CC’s will critique your best 5 photographs by email. He will post his 5 best on his web page and all of the students who wish to be posted. At anytime in any of the three sessions feel free to ask questions about anything including technique, equipment, marketing your photographs, setting up a web page, making prints, books, cards or other photo products. Click HERE to print sign up sheet. Payment is due upon signing up to reserve your space. Before October, 2019: a refund less 15% service charge will be granted. AfterOctober, 2019: a refund less 15%, if we can fill your spot, will be granted. No refunds after October, 2019. Payments can be made with checks, cash, MasterCard, or Visa. CC Lockwood reserves the right to cancel any scheduled workshop if it does not fill up to the minimum required number of participants. If such a case you will receive a full refund.